The International Symposium on Dynamics of Vehicles on Roads and Tracks is the leading international Symposium bringing together researchers, scientists and engineers from academia and industry in the field of ground vehicle dynamics to present and exchange their latest ideas and breakthroughs. 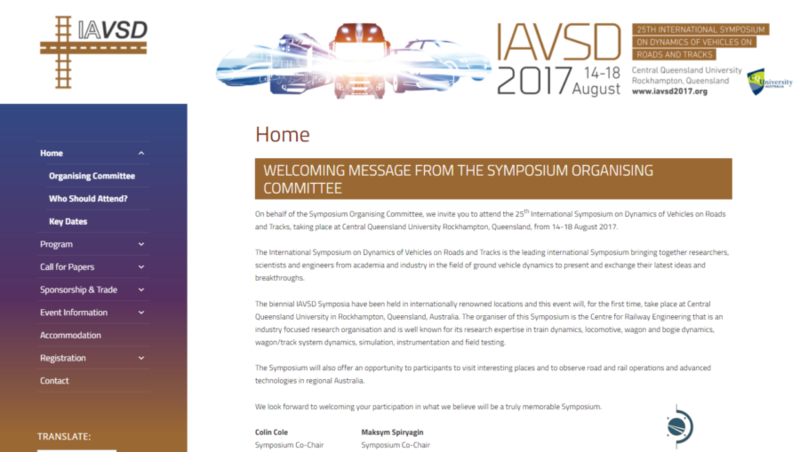 The biennial IAVSD Symposia have been held in internationally renowned locations and this event will, for the first time, take place at Central Queensland University in Rockhampton, Queensland, Australia. This website needed to fit this year’s branding and colour scheme, while still providing users with a simple experience. Being a conference site, an abundance of information was necessary, which presented the additional challenge of arranging it to be easy to read, and quick to find. This was accomplished within the constraints of having a relatively low number of pages with anchor points within the content, accessible by the drop-down menu items. In addition, being an international symposium the website needed to cater for visitors of varying languages, this was addressed with an easily located translator feature.